Here’s how to practice for our 50th Reunion: Attend a regional mini-reunion! Over a dozen classmates, mostly from the Midwest, gathered in Chicago the last weekend of April. It was an extraordinary weekend of conversation, fun, fascinating tours, reuniting with classmates who are old friends, and making new friends among classmates we hardly knew in college days. 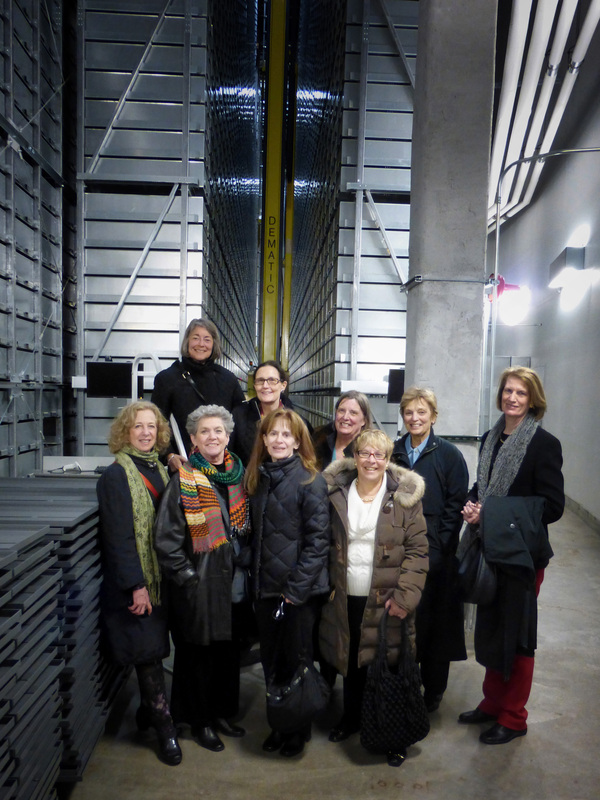 We dined together, toured the University of Chicago campus, explored its subterranean library storage and marveled at its art and architecture. A clinical psychologist and Amherst grad joined us to discuss the findings of his research on lifetime satisfaction among Harvard grads and the implications and differences relating to women of parallel educational backgrounds. He provided a good starter for ideas on ways to get a better picture of our class as we celebrate our milestone reunion. It was so good to reconnect with classmates and to see all the interesting directions our lives have taken us. A big thank you to Polly Barker Duffy for graciously hosting us in her lovely apartment and for Martha Wagner Weinberg for helping organize the day of connecting, conversing, creative thinking and continued learning. And, most of all, fun! 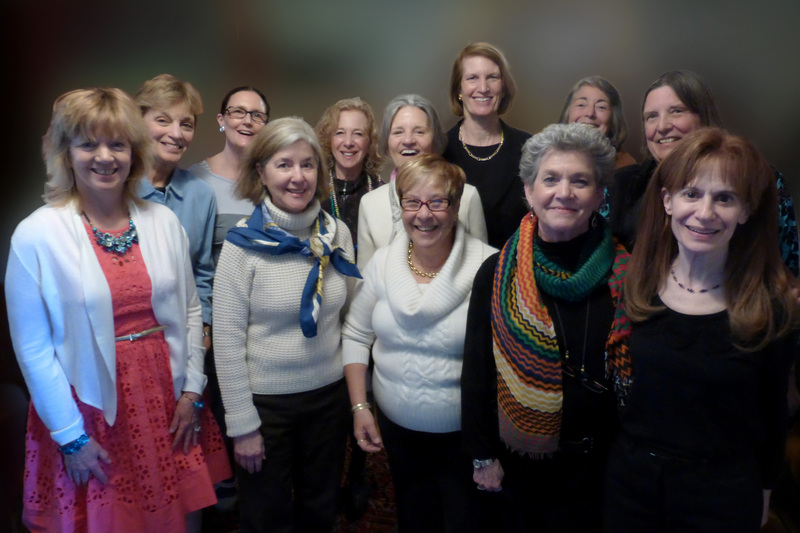 (Front Row, left to right): Diane DuBois Marsh, Wheaton, IL; Judith (Judie) Paine McBrien, Wilmette, IL; Judy Brown Kleinman, Pasadena, CA; Ellen Kipnis Kanner, Cambridge, MA; Terrie Gale Adler, Washington, D.C. (Back Row, left to right): Martha Wagner Weinberg, Urbana, IL; Paula (Polly) Barker Duffy, Chicago, IL; Patty Hershey Beutler, Lincoln, NE; Margaret Von Blon Wurtele, Minneapolis, MN; Gayle White Jackson, St.Louis, MO; Peggy Printz, Seattle, WA; and Sherrie L. Connelly, Cincinnati, OH. Attendees were Diane DuBois Marsh, Wheaton, IL; Ellen Kipnis Kanner, Cambridge, MA; Gayle Jackson, St. Louis, MO; Judith (Judie) Paine McBrien, Wilmette, IL; Judy Kleinman, Pasadena, CA; Margaret Von Blon Wurtele, Minneapolis, MN; Martha Wagner Weinberg, Urbana, IL; Patty Hershey Beutler, Lincoln, NE; Peggy Printz, Seattle, WA; Paula (Polly) Barker Duffy, Chicago, IL; Susan Minter Oates, Gunnison, CO; Sherrie L. Connelly, Cincinnati, OH; and Terrie Gale Adler, Washington, D.C.
At our Chicago mini-reunion April 26, members of the Smith class of 1967 from the Midwest and beyond met old friends, made new ones and continued planning for our 50th reunion in 2017. Classmates visiting the University of Chicago Library’s new Mansueto underground storage facility April 26 included (Front Row, left to right) Patty Hershey Buetler, Ellen Kipnis Kanner, Terrie Gale Adler, Judy Kleinman, (Back Row, left to right) Peggy Printz, Polly Barker Duffy, Sherrie L. Connelly, Martha Wagner Weinberg, and Gayle Jackson.